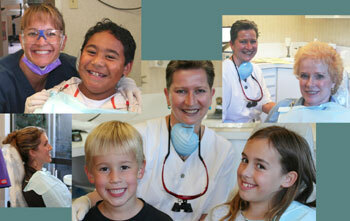 Our team of friendly, caring professional staff are trained to provide the highest quality dental care. We work hard to make each patient as comfortable and relaxed as possible with every visit. Cosmetic Dentistry procedures: Porcelain veneers, bonding and teeth whitening Click here to see samples of the cosmetic dentistry of some of our patients. We strive to restore not just the function of the tooth, but also the beauty. Our office also provides Orthodontic dentistry with a holistic approach. The differences between holistic dentistry and traditional dentistry can be seen in their approaches to orthodontic dentistry. Orthodontic dentistry is a dental specialization the deals with the problems of tooth alignment and bite problems. In traditional dentistry, the goal is to straighten out any teeth to create a visibly attractive and seemingly healthy set of teeth. However, holistic dentists feel that this view of orthodontic dentistry is not enough and can lead to further health problems. Rather than just limiting orthodontic treatment to teeth straightening, holistic dentists will use a practice known as orthopedic orthodontics in which they will ensure that the muscles of the patient's face and the patients head and neck are properly aligned. By engaging in this practice, holistic dentists are not simply limiting themselves to treating an oral condition but are creating preventative solutions to problems that may affect the patient's jaw, head, neck, and spine. A strain or distortion of the skull during birth, associated with the strains of the connective tissue envelope of the body, can cause self perpetuating imbalances that are maintained throughout life. As a child develops, these can manifest as distortions of the jaw with crowding or misalignment of the teeth. These imbalances can be seen in the posture of the child as well as in the symmetry of the child's face. In an adult these strains can express themselves in different ways. Often the strain patterns that have arisen as a result of disturbances in growth and development are compounded by changes introduced to the mouth by dental care performed inappropriately. In the case of the chronic pain patient who may have a history of trauma, it has been recognized that the body will maintain patterns of strain which occurred at the time of injury for years. When the patient has involvement of the jaw it is important for the bite to be corrected along with the release of distortions within the body through manual medicine, such as Cranial- Sacral Therapy, Osteopathy or specialized forms of Chiropractic care. Orthodontics in this country has evolved with a focus on the development of braces, with all their limitations, while in Europe there was a great interest in the development of removable plastic appliances to guide the growth and development of the jaw structures. This has given rise to the specialized field of Oro-facial Orthopedics. This integration of the benefits of this work with what had previously been available in the US has taken place over the last twenty years or so. As our understanding of the holistic nature of the human body has evolved, we have come to appreciate the profound interrelations between the mouth and the rest of the body. We now understand how the body is affected by stress and trauma and how dysfunction of any part of the body affects the whole. The recognition of the need to integrate the function of the mouth with the rest of the body has led to orthodontic appliances that treat distortions of the mouth in three dimensions. These appliances are called light-wire functionals and have developed through the contributions of practitioners named Crozat, Kernot, Jecmen, and others. These appliances are fitted to the dental arches and apply a continuous gentle force to the teeth and the bones of the face and skull. They have three primary functions, first to correct distortions of the skull, second to correct distortions of the upper jaw, and third to correct misalignments of the upper and lower teeth. In the process of doing this, the muscles of the face, head, and neck are brought into balance and harmony. The appliance is fitted to the teeth of the upper jaw and is being used to restore balance to the bones in the skull, at the same time it is being used to promote full development of the upper arch. When the defect to be repaired grows to a significant size, the strength of the tooth will be compromised. We often see teeth with old mercury fillings that are developing cracks in the enamel and underlying structure because the filling has acted as a wedge in the tooth over time. These teeth are best restored by means that reinforces the strength of the tooth by covering a portion of the tooth in the case of an veneer or the entire tooth in the case of a crown. Wherever possible we prefer to conserve the enamel of the tooth and use an onlay. Today we are able to do this in either gold or ceramic materials. Gold has traditionally been the material of choice, though with advances in ceramic and bonding technology, the cosmetically superior ceramic veneer or crown has become preferable by the majority of our patients.